Bossy Italian Wife : Tom Turkey Sandwiches!!!!!!!!!!!! Guys, I love Thanksgiving. It's such a relaxing day and there is so much food. This year we are going to my mom's house for the holiday and it's gonna be a big dinner filled with family and fun! I am really excited. REALLY EXCITED. But as much as I loooooove Thanksgiving Day, there is a day I might like just a smidgen more: the day after. Why? Tom turkey sandwiches. It is my favorite sandwich, hands down. And this year, because I am pregnant, I haven't had a stitch of lunchmeat in over three months. I can't wait to sink my teeth into my favorite sammie! I'm gonna eat a tom turkey, sip a virgin mary and just love life. I am so stoked on my favorite sandwich that we make our own turkey despite going to a fully stocked Thanksgiving meal at my mom's house. Actually, this duty falls to my husband who goes to a friend's house where they deep fry turkeys together. It's great because I relax and then a turkey magically appears on my doorstep, cooked a delicious and ready to be eaten! That's bliss, right? Anyway, I wanted to put this out there nice and early so that you guys can prepare for the Tom Turkey extravaganza. Here's some lovely leftover turkey. Heeeelllllllooooo. Then I made a box of Stove Top. That's right--no frills ladies and 'gents, just all goodness. 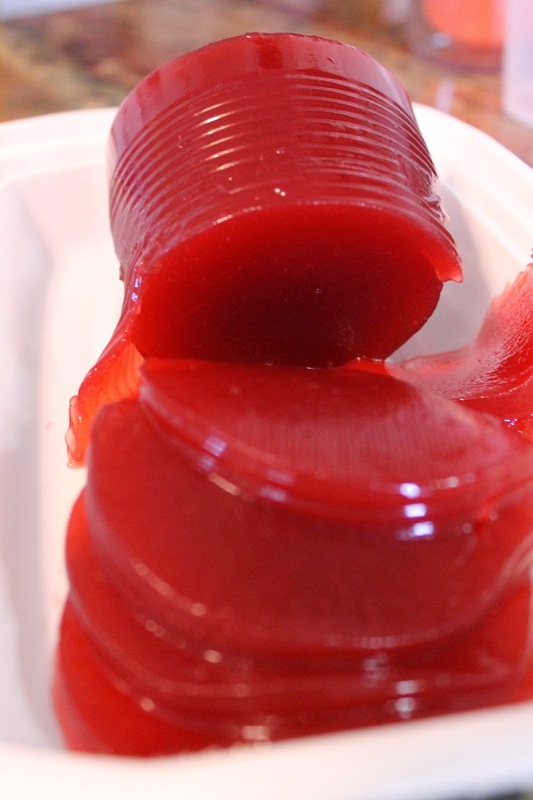 The no frills continues with a lovely can of jellied cranberry! I don't normally buy things in cans, but for these sandwiches, I will make an exception. Doesn't that look perfect? Let's get closer, shall we? Yes, that's right where I wanna be: in the thick of the sandwich! Time: You got 10 minutes? | Makes: 4 sandwiches | Difficulty: Easy! Slather your bread with a healthy helping of mayonnaise. Stack the turkey, two slices of cranberry jelly and a big old helping of stuffing on a slice of bread. Top with the other piece of bread. Cut in half.